Valentine got the graveyard slot on Sunday morning, but the session was well attended. Before he came out on stage, one of the stewards brought out a tray with a teapot and a cup of tea. 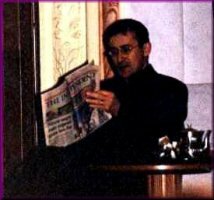 When introduced, Valentine walked out with a newspaper, ignoring us all, sat down and poured himself a cup of tea, then started to read the paper. After a moment, he “realised” with a start that he was not alone. Val said that he was disappointed with the way the big fight at the end of First Knight turned out, considering how hard they had worked on it. He said that films with that kind of budget tend to leave the action sequences to the second unit. They had trained for three weeks for the battles, but they had ended up with one action shot per principal actor. The fight itself took five days to film. He said that, when they were filming Guinevere’s arrival at Camelot, one of the crane towers overbalanced and trapped the guy who was on top of it underneath it, severing his leg. He said that Sean Connery was impressive and wielded quiet authority on the set. Valentine also knows Jason Connery and says he is just as nice as his father. Asked about his readings at the Homeland Convention, he said there no plans for him to do any tapes, but he would like to do it if asked. He was reading Raymond Chandler’s novels at the moment and felt that Duncan MacLeod and Philip Marlowe were on opposite sides of a very fine line. He said that the birth of Jude had changed his life profoundly and extended thanks on Jude’s behalf for all the gifts that they had received. Although Jude had prior commitments, he had sent a message and the proud father had a tape played of the younger Pelka’s gurgling, to general delight. Of researching characters, he said that Kronos had required none, whereas Shelley, although he had lived only 31 years, had packed his life full enough to warrant a 600 page biography. He felt that Kronos was a concept rather than a character and that the Horsemen were a manifestation of the evil in society. His childhood heroes were an American comedian called Hyram Halliday, cartoon characters Noggin The Nog, (at which he went up in my estimation immeasurably! ), and Captain Pugwash. He had liked William Tell and Errol Flynn in the original Adventures Of Robin Hood. He also admired writers, particularly French and English writers, especially from the Victorian period, but he had latterly started to read American authors. He said that What Rats Won’t Do should be available on video soon in the UK, but that it might still have a limited theatrical release in the States. He had liked the original Star Trek, but said he felt for Michael Dorn, as he hates the make-up chair himself. For Ivanhoe, he grew a beard and permed his hair to avoid a lot of make-up. He said that the scar for Kronos took about two hours to apply the first time, but once the make-up artists had sorted out where it was going, it took only 15 minutes to apply after that. He diverted into a story about his cat. He has just moved to a new house, so not only has the cat to contend with a rival in Jude, but e has to assert himself in a new neighbourhood where there are a lot of cats, one of which, a ginger tom, seems to beat him up on a regular basis. However, Val said that the cat had now accepted Jude as part of the family and had also recently gained the upper hand with the ginger tom, so things were settling down. Asked to contrast Kronos with Andre Korda, Val said that both were arrogant and egotistical, but that Korda was a chess player, playing mind games, and a backstabber, whereas Kronos would just sweep the chess pieces from the board and would tell his opponent to turn round, so that he could face them. Thoughts of right and wrong never entered Kronos’ head, just what he wanted to do next. Kronos would definitely bite the heads off Jelly Babies first. He spoke of how he admired Kevin Kline’s range and ability and said that he didn't have a preference for comedy or drama, as long as the role was good and he had variety. He could happily spend his career playing Kronos, Hamlet and Graham (from Rats). In response to a question about fans inevitably treating him as other than a stranger, he said that he felt he could just go with it and he had enjoyed the conventions he’d been to so far. He said that he felt he watched too much TV and was going to have to change that, now Jude was around. One day, when his son was old enough to distinguish reality from fiction, he probably would let him watch the Horsemen episodes. He claimed not to be able to work his VCR, but as he was married to a Japanese, who obviously has an instinctive understanding of technology, he didn’t worry about it too much. His favourite programmes are Match Of The Day and the comedy The Fast Show. Asked of his opinion of soaps, he said he hadn’t got one - he doesn't watch them and he’s never been in one before, although as they can be responsive to current events, being filmed shortly before broadcast, he felt that they could get a little glum. He said that, courtesy of Gillian Horvath, he felt that he had the writing bug and was eager to finish his short story, so that he could start on a screenplay he wanted to write. Of the trans-Atlantic trade in videos, he said he didn't mind particularly as long as it was fair play and nobody was trading in them. Of working with Bob Anderson and F Braun McAsh, he said that Braun was a Vietnam vet and interested in the sword, whereas Bob was an Olympian swordsman and this showed in their work. He liked the way that Braun developed a fight style based around the character, although he said that Braun, who is quite stocky, designed Kronos’ sword and that he could hardly lift it when he first tried. Valentine has worked with Mark Ryan, as he mentioned in the session with Marcus, and said that he had a good interplay with Mark, as he had with Adrian. Valentine doesn’t want to work away from his family for a while, hence his involvement in Family Affairs, as he wants to work in TV and small films. He felt that success for The Raven was never going to be easy, as there is no Adrian, but they wanted to keep the fan base. they are working to make it a thing on its own and he said that he got the impressions that they were getting more comfortable. Dennis Berry had been uncharacteristically calm on set, even to taking advantage of foul weather to frame certain shots to create a mood - the raiders riding back to Korda’s temple in the flashback in A Matter Of Time. Valentine said he loved working with Elizabeth, but he felt that spin-offs were always tricky.